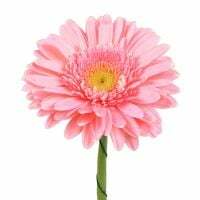 Gerberа pink(5 pt. ), Rose shrub white (3 pt. 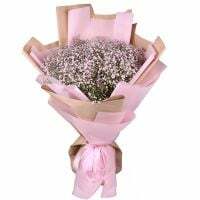 ), Gypsophila white(1 pt. ), Tape(1 pt. ), Greens(2 pt. ), Packing(1 pt.). 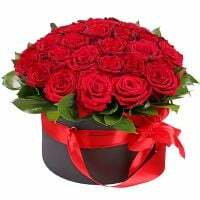 Birthday, Colleague, For children, For grandmother, For her, For mother, For young lady, Gratitude, I Miss You, New-born, Sorry, Teacher, Wedding flowers. 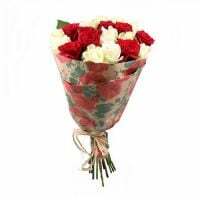 The thin light-green leaves are an excellent background for every flower of this wonderful bouquet which excites only tender "Feelings". 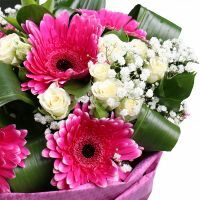 The huge pink gerberas outshine even the beauty of the queen of flowers – compared to them the white spray roses look like small buds. The numerous tiny flowers on the openwork sprigs of white gypsophila resemble little elves surrounding the queen. 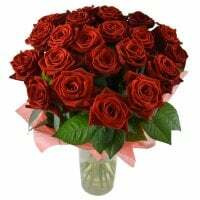 One cannot but like this exquisite bouquet because it is able to express without any words your tender feelings on name day, Valentine's Day, on the first date. The flowers will be your devoted helpers on the engagement day. They are so pure and gentle! 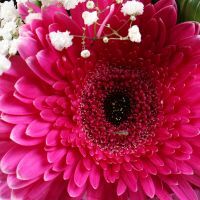 Design of the bouquet may differ from the one presented on the site. The vase is not included into the price. Grace, charm and beauty. Words that fit UFL perfectly. I'm happy to know you!